After the removal of two decades of economic, trade and financial sanctions imposed by the U.S. on Sudan in October 2017, Sudan's economy is expected to have positive impact over the next six years. By 2018, the GDP of Sudan is expected to reach $41.7 billion (at current prices) as compared to $58.2 billion in 2017. On the contrary, South Sudan's GDP is expected to reach $3.2 billion in the same year. Several sectors in Sudan and South Sudan such as infrastructure, healthcare, and education are likely to register growth in terms of import of several commodities; primarily on account of expected FDIs from various countries coupled with growing construction projects. Some of the key players in the Sudan & South Sudan acmarket are LG Electronics Inc, Samsung electronics Co. Ltd., Fujitsu General Ltd., GREE Electric appliances Inc. and Midea group Co. Ltd. 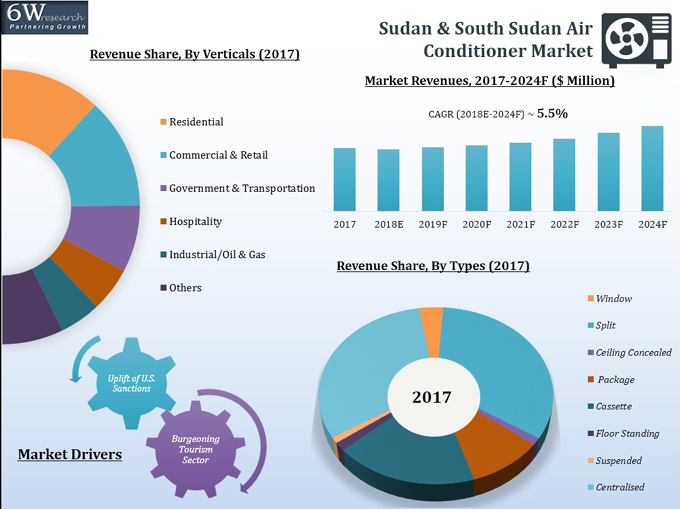 The Sudan & South Sudan acmarket report thoroughly covers the air conditioner market by AC types, applications, and regions. Sudan & South Sudan acmarket outlook report provides an unbiased and detailed analysis of the Sudan & South Sudan acmarket trends, opportunities/high growth areas and market drivers, which would help the stakeholders to decide and align their market strategies according to the current and future market dynamics. 19.2. Samsung Electronics Co. Ltd.
19.4. GREE Electric Appliances Inc.
19.5. Midea Group Co. Ltd.